Chasewater Stadium was never salubrious. Down at heel, scruffy, it never really took off. Image from ‘Memories of Brownhills Past’ by Clarice Mayo and Geoff Harrington. Here’s a curious piece of ephemera, found by local history ferret [Howmuch?]. I’m not sure of the source, but it was probably a charity or secondhand shop, as he can often be found ferreting around the darker corners for history oddities. He’s certainly turned up trumps here. What we have is a PDF scan of a programme – costing 20p at the time – for a full afternoon’s racing at Chasewater Stadium, Brownhills, on Sunday, 17th April 1977. 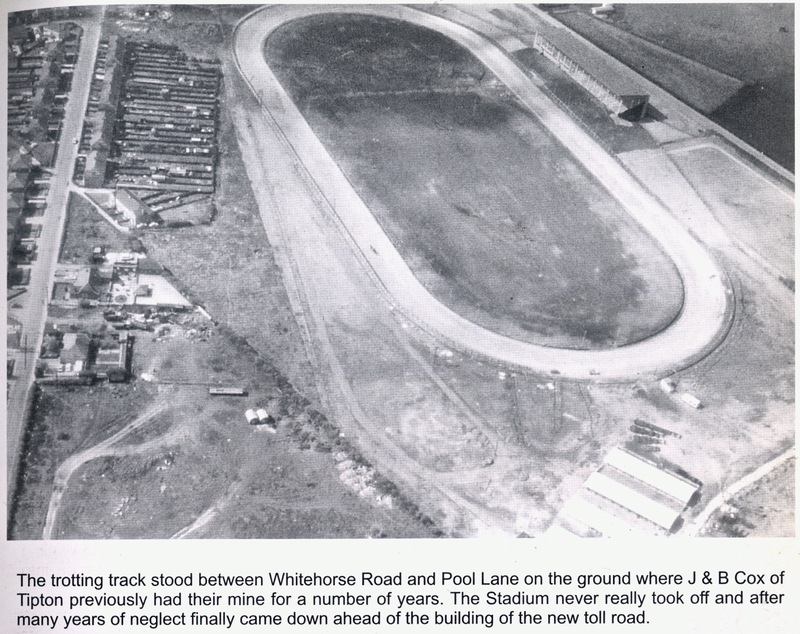 The track looking south just after construction. Note the stables, bottom right. Whitehorse Road is on the left, and Pool Road on the right. In 1977, the site would echo to the roar of motorbike engines. Image from ‘Memories of Brownhills Past’ by Clarice Mayo and Geoff Harrington. At the outset, I don’t understand much of what this is about – I’m not into motorbike racing (although the spectacle is great), so I don’t really know how significant this was. However, the adverts, names and feel of the programme gives a real hint of the atmosphere at the time. Whoever purchased it was clearly an avid fan, and noted race winners, points won, etc. What is significant is [Howmuch? ], who knows about these things, thinks this was the only such race held at the doomed Chasewater Stadium. Built as a trotting track, it was never really successful, and the operators experimented with various other sports the track could adapt to – including motorbike racing, and I believe banger racing. None succeeded. The stadium can be seen in the background to The Stymaster’s Chasewater home movie. The stadium fell derelict in the 1980s and was demolished to make way for the M6 Toll in the late 1990s. South of Chasewater dam and the M6 Toll, the outline of the track can still be seen to the east of Pool Road. The ghost of the track is still witnessed in the landscape – local kids often use it for impromptu bicycle races. I get lots of searches for this stadium, but know little about it, so this great find sheds some light on a quite dim corner of Brownhills history. If you have any memories of this, pictures or anything else to contribute, do comment here please, or mail me at BrownhillsBob at Googlemail dot com. Cheers. An interesting event, with results carefully hand documented. Click on the image to download the PDF file – it’s about 5 meg, so may take a while. This entry was posted in Brownhills stuff, Chasewater, cycling, Environment, Events, Fun stuff to see and do, Interesting photos, Local History, Local media, News, planning, Reader enquiries, Shared media, Shared memories, Walsall community and tagged 1977, April, Brownhills, Brownhills local history, Chasewater, Chasewater Promotions, Chasewater Stadium, Cheap tat, Derelict, Events, Howmuch, International Long Track, JB Cox, Local History, MCN, motorbike, Motorcycle, Motorcycle News, planning, programme, race, Race of the Year, Redevelopment, Reservoir, Stadium, Staffordshire, Things to do, track, Trotting. Bookmark the permalink. I remember going to this meeting, it was a long track meeting , similar to the more fashionable speedway , but as the name suggests run on a much longer track which did not give the thrills and spills of the shorter sport, some very famous riders from the day were riding then. The problem also was the opposition from the locals who felt taht the noise and dust created was to much for them on Sunday afternoons as some of the back gardens in Whitehorse Rd were right by the back straight.I was a regular at the trotting meetings there, when first built the stadium was the ‘ wembley’ of harness racing in the UK, The first purpose bulit track with floodlights to allow evening races, when the sport was mostly run on grasstracks in Wales, Scotland and in the North West and the London areas, the main event of the year for the sport the National Pacing Derby was always run at Chasewater.and horses from al over the country would come to run there. Some locals too ran there , Ken Banister from the Chase Inn had a horse, also The Platts from Norton ( In these PC days best not to put Stans nickname on here !!!!) The Lees family from the Walsall area also , one of the family Steve went on to become a pro driver both here and for a time I believe in the US and Canada where it is realy big time. The best horse we ever saw over there was a Trotter named TED TROT , owned by a scrap man from Wolvo named Joe Watton and trained and ridden by the Lester Piggot of trotting, Johnny Blisset. The sport still goes on today, with a major track at York and is on TV Wales SC4 every week once the summer comes from the grass tracks of Tregaron and Aberystwyth, and Tir Prince near Prestatyn. Is that you Ian ? it is. Who else would know that. Have you been since.I still go. I also did some work there back in time, the one lady in the ‘ office’ that I remeber, she did the programmes, I will never forget her name because it was so unusual, it was Freda D’eath . Mom temped there on and off for a couple of years. Presumably they asked her in when work demanded. She liked working there from what i remember. Good find,the programme brings back some memories of bike shops i used when i was a kid.The ads from the Yammie shop (JP Motorcycle Generation in the High Street and the Honda shop in Silver Court in particular.I also recall going to a bike show at the stadium with my Dad and brother. I can also remember going to a Motorcycle show at the Trotting track, and to see for the first time the SUZUKI RE5 (Rotary engine design) bike. J P Motorcycle Generation, now was that Brian and Jean? I can remember Jean riding a Ariel 3 wheeler, the one that was articulated in the middle. Jim and Jean Pearson…worked for them when I left school in 1979. I think his name was Jim Patrick ????? they used to have the lightweight shop on Hednesford Rd opposite Rose Villa ( correct me if i’m wrong ) and then moved onto the High Street.I don’t know if this is an urban myth,but there was a girl in our year( 75-77) at the Comp,her last name was Mauger and she was supposed to be Ivan Maugers daughter ????? Thats right emell, it could well be Jim, and they did have that little shop opposite the Rose Villa (The Goat) then they move to the High st Brownhills, then we had the Honda shop in Silver Courts at about the same time. Which was run by Brian Crighton. Clive, do you remember the Honda shop when it was in two connecting shop units on Silver Court and then they moved into the old Jaygor shop,which was huge ( where the council offices are/were) It was an impressive shop as i recall and a big move forward.This was in the era when people came to Brownhills, the then shopping mecca. I was told by my brother that he helped to build the stadium. Thats probably why if fell into disrepair, ha ha . His name was Roy Phillips, nickname Podgy. Hello emell. Yes i do remember the Honda Shop when it expanded into the double room shop. I used to purchase my bits from there as i was a Honda fan, i also purchased a CB500T from there. Brian Crighton use to race at Darly Moor, seen him there many times in the 70s. and as you may already know he managed the the Norton rotory engine team at Shenstone for quite some time. Hi Clive, i recall BC having a tuning business at the rear of Silver Court,after the Honda Shop closed down.He still works for Norton at Castle Donnington. Hi emell. Nice chap Brian, and a very clever bloke aswell, he made some very intresting bikes up, including drafting engine together to make up some classic hondas from modern bike engines of the time. Drafting sorry i should say Grafting, these keys keep on moving on my keyboard! Hi Clive, there used to be a bike shop on the Wilkin estate around the late 70’s,more of a fixer/repairs place than a dealer.Me and my mates used to go to Waiklin and Ward at Aston near the Villa ground,Hyland Crowe at Erdington and there was the emporium of Vale Onslow in Brum which was a hike from the bus stop.Hyland Crowe was know as the Greeves Centre ( MX ) and what a let down when we got there,we all had visions of this bike shop full of MX bikes and it wasn’t…… nice Greeves sign above the door,on what was essentially a corner shop. I used to have lunch during the week at Hyland Crow when I worked in that area….a few of us would take in Pork Pies with ridiculous amounts of Mustard and discuss the weekend racing…..usually who fell off the most!! The Motorcycle Generation in Brownhills High Street was owned and run by Jim and Jean Pearson, very good friends of mine. the owner promised that it would never be used for Motorcycle or Car racing and planning was eventually granted with this as a condition. Is this the track connected with my Great-Granddad Oscar?? I can remember going to the race’s but never knew where it was? Sara,I take it your grat bGrandad was Oscar Johnson or Oscar Johnson JR is so then yes this was where they used to race, I saw them win many races there. Yes, my great Grandad was Oscar SR, Oscar JR my great uncle, and Tom my Grandad. I’ve seen some pictures of them racing, my lovely Grandad kept all sorts of stuff from the horses (bridles and the like), and cups they had won. Nice to speak to someone who saw them … All of them sadly gone now. I lived in Hednesford Road the Honda shop was in the old chip shop. The Platts including Stan,Ken and their Father all lived there so were not from Norton. 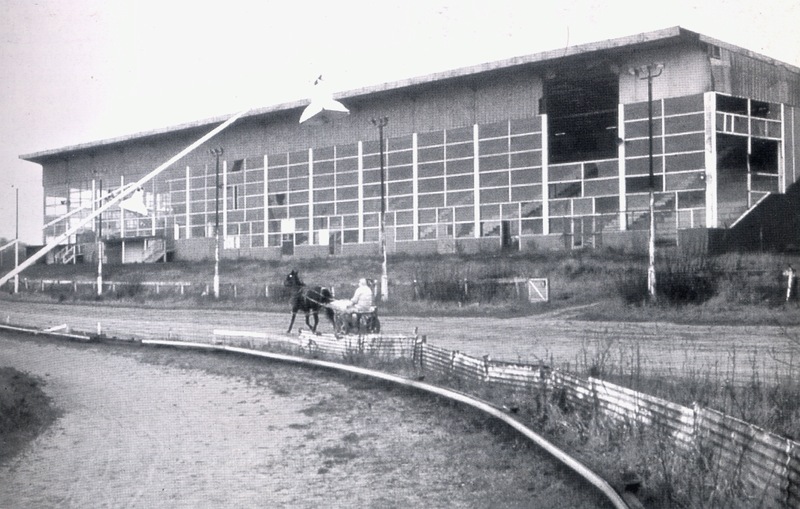 The trotting track was a white elephant. forgive me if I’m wrong but I don’t see any mention of the grehound racing that went on there in the 1980’s….my dad John Bailes used to run them there and we as a family helped out to try and keep the place running…I used to type the racing sheets up. didn’t last too long though. the place needed so much work doing at that point. To be fair, I have no information about that, so can’t relate it. Open to offers, though, if you fancy jotting down your memories? I’m after any info or memories people have! I certainly didn’t know it had taken place… fascinating. Cheers to you both! My memories of it are vague, as I say, I only went on a couple of occasions, however, at least one bookmaker would be in attendance, which I think was Emerys of Norton, and entry was via the embankment at the A5 end of the grandstand. Thanks – that’s excellent – cheers! I think the problem was that there were so many established tracks at the time, such as Hall Green, Perry Barr, Willenhall, Monmore and Cradley. Different track. Both are now derelict, but still visible on Google earth. 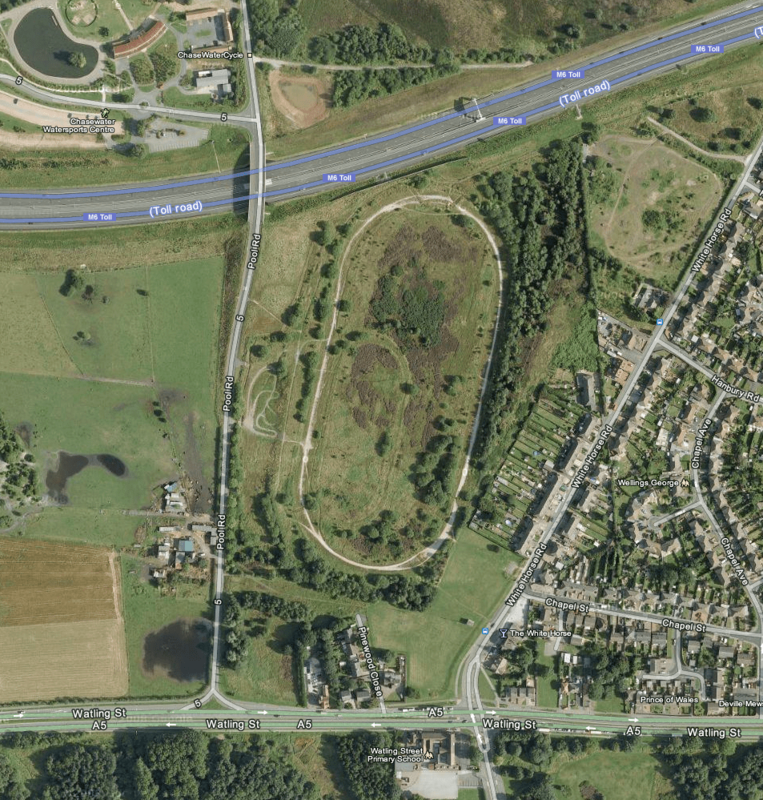 Norton Canes is to the east of Chasewater, the old trotting track to the south. I am glad i have found this programme, it does bring back great memories for me, i was 15 at the time and was in Brownhills high street with my mates just wondering what we could do when we heard the sound of motorbikes, we did not know there was a race on at the track so we walked towards the sound which took us to the track, we all had a great day there which has always stayed in my memories, thank you for putting this on the web, it was good to go over it again. From Rob who used to live in Brownhills. Not sure if anyone remembers, but my dad used to run Chasewater Trotting and dogs in the early 80’s, anyone remember Bob Burks perchance? I might have some old photo’s of the place from around that era, plus Norton Canes. Anyone remember the grand re-opening with Eddie Kid?? I remember the posters and the fuss! Anything you’ve got would be ace, please! Give me a month, I work abroad and won;t be home for a while, when I get home I’ll have a root through some old pictures for you. We used to live in Walsall Wood and my dad went into partnership with a chap called Dave Charlseworth, both ran newsagents at the time and were into greyhound racing, so they rented Chasewater Stadium and tried to make a go of it with the greyhounds and trotting, didn;t pan out unfortunately. My brother was Bill Howe. My first paid work at age of 13 was working for Oscar Johnson in his stables at Walsall for a week in the summer. Johnny Blissett was most amazing driver. I knew the Wattons and the Hughes family. Bill Howe sadly died in 2010. My name is Thomas Johnson I am the son of Thomas Anthony Johnson and the grandson of Oscar Johnson. I am looking for any information on my dad and grandad from their racing days any help would be greatly appreciated. Thomas, I have got loads of racecards from Chasewater, give me some time and I will see what I can find. Also there is a Harness Race website,have a look at that and put a request for info on there and I am sure you will get some more info.